3 SUD EST or “The Kings of the Music Dance” as they are called by their fans, are the most appreciated dance group, both public and media, being rewarded with the most important awards of the Romanian music industry and not only. 3 Sud EST, 20 years the best dance music (pop) group in Romania and Europe. 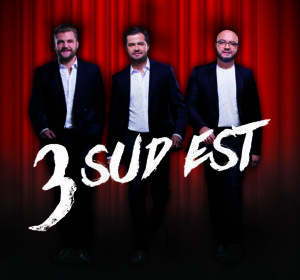 3 SUD EST is the group who over 20 years ago brought for the first time the dance/pop music in the Romanian discos. They can be called as the “Backstreet Boys” of Romania. They became extremely famous in a very short time and their songs remained over the years the biggest hits. Even recently, their new songs are no. 1 in all of the Romanian music charts. They wined several awards and they released several albums and CDs. 3 SUD EST is for sure one of the most prominent “pop, soul and dance” group from Romania and they have over 20 years of artistic career. Each member of the group has a particular technique that they know how to exploit during the interpretation of their songs, becoming through the years so popular that they start to be called “The Kings of Dance Music”. They are the winners of several awards, they launched several albums and CDs, and in the last two years continue to be on the top of the most famous Romanian charts.3 SOUTH EST is the only band to sell in more than 800,000 MCs and CDs in a country that is constantly fighting piracy. A truly musical phenomena, 3 Sud Est was formed in 1997. Shortly, the 3 members of the band, Laurentiu, Mihai and Viorel were declared „The Kings of Dance Music”, and their music influenced the evolution of the Romanian music industry. Among the most famous songs of the band, there are “Ai plecat“ – the single which defined their style, “De ziua ta” or ”Amintirile” are some the most successful songs of the band. MTV Music Awards – Best song award for the hit single ”Clipe” (2004). A month after the band was formed, 3 Sud Est releases the hit-single “Ai plecat” – an absolutely NO 1 hit on radio and TV music stations and clubs’ plays-list, throughout an entire year. In May 1998, 3 Sud Est releases their first album, named “3 Sud Est”. The album had an amazing success, like never before in Romania, being sold in over 200.000 original copies on audio cassettes and over 6.000 copies on CD. In December 1998, the band wins Ballentine’s Award at Dance Section, organized by Media Pro. Same month, at Cat Music Award Show, 3 Sud Est wins best-sold band award of the year. In 1999, 3 Sud Est releases the album “Visul meu”, which in only 2 days, is sold in over 30.000 copies. First track is “Tu esti vinovat”. In 2000 – The EP “Imi plac ochii tai”, which was re-edited in October, same year, alongside the bonus track “Te astept sa vii”. In a very short period of time “Te astept sa vii” gets on Romanian Top 100, where, for the first time in history, a Romanian band competes to international ones, and 3 Sud Est takes 1st position. In the same year, 3 Sud Est wins the Big Award at Mamaia Festival & Best Dance Group-dance award, and at the end of that year, the book and CD “3 Sud Est”, a new premiere for a music-band in Romania. In 2005, 3 Sud Est brings the single and album “Cu Capu-n Nori”. After 11 intense years in the music industry, tens of hits and awards, the band ends its activity. In 2014, the hit-makers, 3 Sud Est reunite and release the single „Emotii’, simultaneously, at all radio stations in Romania. Also, in May 2014 the band has a mega-concert named „Emotii”, at Sala Palatului, show which marks the band’s comeback. The hit-single “Emotii” was declared The Song of the Year by Media Forest Romania. Also in 2014, the band releases the song and the video “Liberi”. 2015 means the amazing featuring with Inna for the single “Mai stai” in the spring and in the autumn their single “Tic Tac”. 3 South East shares the same positive emotion for fans yesterday and today and launches a new single, composed by Laurentiu Duta and produced by 1ArtistMusic, alongside Cat Music. “It’s a love story or a love affair for all the people who supported us, inspired and always been our team, our soul and our joy. It’s a “thank you” from the South East 3 for love in my personal life and for the big gang of fans, those who admire us, watch and whom we chose to thank for all, “says Laurentiu. “Emotions” is a sharing of our feelings, in the 3 South East, our musical brand, which has consecrated us and which, we say, will move our hearts and bring together the fans of our generation as well and the smallest, this cool, sensational world that knows about the history of our band and who was waiting for a new South East song. After all, when it comes to love and joy, it’s actually the same … emotions, “says Mihai. “It was a great experience, we were glad we would be back together, and in the studio and have another musical project as a team. Gasca has returned, we are here for you, with all your soul and many … Emotions, “adds Viorel. The single “Emotions” was released on February 28, 2014 at the same time on the radio stations Kiss Fm, Radio 21, Pro Fm, Radio Zu, Radio Romania Actualitati, Europa Fm and National Fm, and is currently running in playlists big radio stations in the country, pretending to be a real musical success, according to the radio.